For the 2012 Accordion Babes calendar project I had a photographic concept, sure to be fantastic, creative, intriguing and, for which I needed bones. Death was too busy to volunteer for the photo session but one of his younger brothers said yes. Now, younger bro’s day job is working as a chiropractic office skeletal model but he dreams of a career on screen. He jumped, well more like lurched, at the opportunity. I picked him up a a day before the photo shoot and he stayed with us a couple nights. GDub captured his intense personality in wonderful black and white. Then I worked with younger bro on wardrobe and posture — slight irony there. My idea was to use him as a supporting actor in a period tableau. I had done historical research, gathered props and costumes. Photographer John Clayton and I had had a pre-shoot meeting to discuss lighting, mood days before. We were prepared. On the day of the shoot John and I started to set up the shot but it simply wasn’t working. We tried several variations but, in a nutshell, younger bro is small in stature, very slight in build. On film he appeared even smaller — not Danny De Vito (5 feet) but no Liam Neesom (6 feet four inches) either. The character of “Death” needs some, I’ll say it, size. I know, I know. Plenty of male actors are shrimps but I’m not a shrimp and I simply didn’t look right next to a diminutive set of bones. I had to make a directorial call and gracefully explain to younger bro that it was simply a casting issue, nothing personal. I’ve had some tough decisions as a director but cutting Death’s little bro out of a scene was a rough one. Would younger brother accuse me of height discrimination? Would Death be annoyed, insulted? Grim Reaper repercussions? Happily, younger bro was cool with the decision. He was into the process and understood the part about doing what’s best for the shot. And besides he was having big fun hanging in a photo studio–way more exciting than an adjustment room. 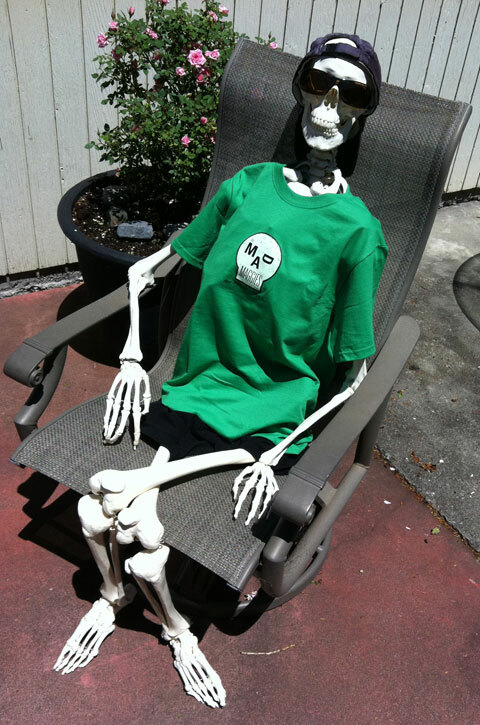 Here’s a snap of him relaxing on our patio post shoot. I brought him back to his day job today. He is very open to future opportunities. accordion babes, creative process, death, John Clayton.